As a bartender, the bar blades are one of the most important bartending tools of our trade. Experienced bartenders know the bar blade is a must-have for your bartending shift. Bar blades come in many different shapes and sizes. The main purpose of the bar blade is opening beer bottles. While domestic beers have twist off tops you will have a sore hand at the end of the night if you attempt to open them by hand. There will come a time where you set it down, or someone is using it, so most bars have a bottle opener on the side of the cooler you can use to get the job done. Or use your hand to twist the top off. If it’s not a twist off you will have to wait to get your blade back or go to the bottle opener. In the video below you will see Robbie open more than one bottle at a time. If you work in a high volume nightclub you will be doing this quite often. Typically a bartender earns one dollar tip per beer served, so serving 3 beers at once means 3 dollar tips. You will want to become good with your bar blade. The more tops you pop the more tips you make! 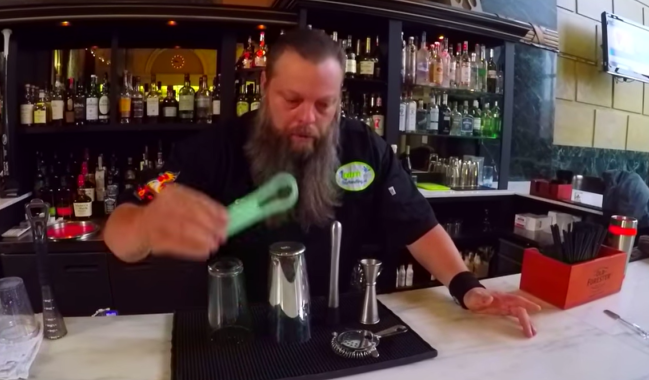 Bartending tools made easy, Not often does something this cool come around, watch as Robbie test drives some of his good buddy Jeremy Leblanc’s revolutionary bar tools “TinPlay” – you can pick these up in our shop. The flair waterfall pour has never been so easy. So easy to do… even I mastered the waterfall pour and looked like a pro within minutes of using the TinPlay bartending tools. and see how easy you can create great cocktails, complicated trick pours have never been so easy.